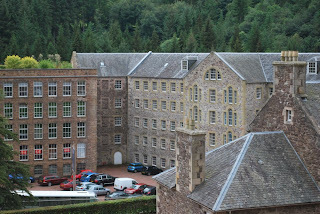 I was aware of New Lanark's yarn well before I knew anything else about the place, and once I'd realised it was also a World Heritage Site with C19 mill machinery, I booked in immediately. I think the most charitable description of the proceedings was "chaotic". As one who had to do the on-the-ground sheepdog-type work on this sort of excursion, repeatedly, over 6 weeks, as a 23-year-old new graduate (and managed it better), I'd personally go for "shambolic", though. It started before we'd even left the campus - 15 minutes after we were meant to have set off, someone left the other coach, went dashing back into the building and emerged a good 10 minutes later with another person. Presumably neither of the organisers had a mobile with them, because although our coach had a microphone, no information was shared as to what the hell was going on (20 years ago I wouldn't have had a mobile either, but I'd have legged it out of the coach to find out what the problem was!). That sort of set the tone for the whole visit. I had the impression that we'd have been divided into smaller groups if we'd arrived when they were ready for us; and we got there an hour and a half before everything closed up for the day, rather than the 3 hours they'd anticipated... They did their level best, but there was a lot to see. They'd prepared a special tour for us focusing on the yarn production at the mills (which is one of their profitable areas - brilliant, given the entirely reasonable prices they charge!) but basically the general effect was Huge Flocks of Confused Knitters milling (sorry) about, not quite sure where they were meant to be going. 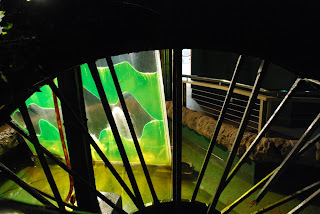 but there were lots of holograms and lights, as well as some more realistic models and so on, and snippets of archive film footage of other mills. 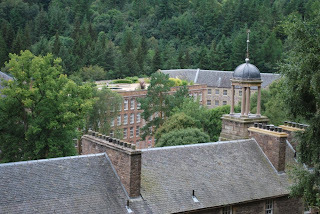 Originally it was a cotton mill, but they got in the wool spinning machines more recently as this seemed to be a more local and sustainable way of spinning (and also healthier for all concerned). 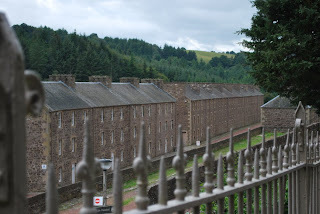 I'd guessed, wandering down the hill, that this was a Model Community; and while work was obviously completely back-breaking, they were also keen to emphasise the work of Robert Owen, the founder of the mill and an early Socialist. It was a huge example of both the positive and the negative elements of Victorian Values, and absolutely fascinating. We saw the ridiculously huge and beautiful carding machine, which is, brilliantly, behind a glass wall at the back of the shop, and produces 28 strands of pencil roving which correspond (of course) to the 28 spinnaret-thingies (I have no idea what they're called for this sort of spinning wheel, but I know what they are in spiders!). 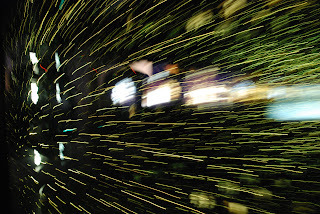 We went upstairs and saw the spinning being done; and how complicated it is to rethread everything when it gets tangled. 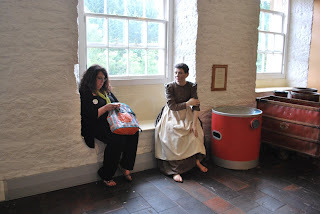 Some of us knitted in company with 19th century mill workers. And for the end (my favourite bit) we went down to the cellars with Alan (? 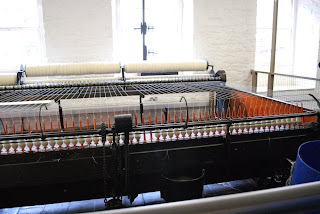 ), the consultant who got all the machinery in there, and saw the huge sacks of yarn waiting to be processed, and the blending machine - a sort of domestic-swimming-pool-sized metal vat in which all the colours for the tweeds are layered, and then blended using a set of wheels, and then sent up to the carding machine by fan and vacuum. Fascinating. We didn't, unfortunately, have enough time to see the rest of the attractions, like the mineworkers' cottages, Robert Owen's house and so on; it would have been lovely to do so. But we had an evening buffet booked for 5pm (which was extremely nicely done; and they also did a prize draw for a bag of yarn, which was very kind of them). We left more-or-less on time - further chaos as everyone on our coach was asked to keep the same seats on the way back so we could work out whether all our neighbours had returned; but presumably that message hadn't been communicated to people on the other coach who piled onto the nearer one to the exit, meaning that nobody had a clue. 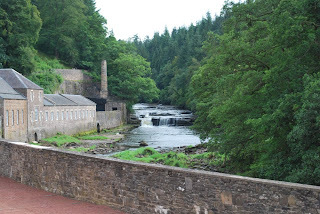 New Lanark is a lovely day out from here and the kids like the place too, so I've been several times. There is a LOT to see, not just the mill section and some of the guides around the place actually worked there when it was still a working mill. Great place for walks and picnics too. There is a Youth Hostel in the grounds too, btw. A thought for the future, maybe?